NEW YORK • Professional tennis trainer Bobby Hicks claims nearly everyone at or near the top of the men's tour uses performance- enhancing drugs. "It's pervasive in tennis and has been for years," Hicks said. And he is willing to name names, starting with Rafael Nadal, Novak Djokovic, Andy Murray and David Ferrer. There is one catch to these public accusations: Bobby Hicks is a fictional character. 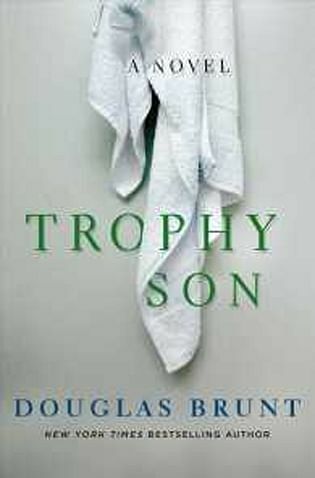 He appears in Douglas Brunt's new novel, Trophy Son, which will be released next week. It tells the story of Anton Stratis, a tennis prodigy whose childhood is stripped away by an ambitious father who nurtures talent and resentment in his son. Stratis, his entourage and rivals are all made up. For the first 80 or so pages, every character is fictional. But then, in Chapter 15, Brunt drops in Hicks' speculation. More than anything else in the novel, those few lines are likely to leap off the pages into a public debate. Brunt said that was not his intention. "I didn't set out to write some book on performance-enhancing drugs," he said. "As a matter of plot, it's a small percentage and sort of a side thread to the overall sacrifice these athletes make in any sport." He worked as a management consultant, in venture capital and as an Internet security chief executive before becoming a novelist. He reached The New York Times' bestseller list with his debut, Ghosts Of Manhattan (2012), about a Bear Stearns whiz just before the Great Recession; and his follow-up, The Means (2014), about a political campaign and a savvy, enterprising and beautiful journalist. Brunt, 45, has three young children with his wife, anchor Megyn Kelly of NBC. Trophy Son was inspired by how childhood sports have changed since his youth to become highly specialised and competitive, as the pressures on athletes trickle down from colleges to high schools to youth sports, adding incentives for them to try performance-enhancing drugs. "Those are the years when you are being socialised and should be figuring out how to engage the world," Brunt said. "But for these athletes, it's like being born into the Church of Scientology," he said. "How do you know you're in this crazy church where you don't know anything else and it all started at an age when you weren't making your own decisions?" Stratis' father resembles Andre Agassi's, an overbearing former Olympic athlete and immigrant, but Brunt said the proliferation of "these crazy tennis academies" as a replacement for high school has more children "giving up any other kind of life". For Trophy Son, Brunt said he interviewed teaching professionals and current and former players such as James Blake and John Isner. The use of performance-enhancing drugs, beyond the few high- profile suspensions such as those for Marin Cilic and Maria Sharapova, became an unavoidable topic, Brunt said. He said using the names of real players was necessary, even though he had no proof they were involved with performance-enhancing drugs. "It resonates with the reader more if they can ground the issue with a real backdrop," he said. "I certainly did not set out to hurt anyone," Brunt said. "I just wanted to shine the light on this issue." Mr Stuart Miller, the International Tennis Federation's senior executive director of integrity and development, saw it differently. "Audiences will see this as statement of fact, not just a piece of fiction," he said. "It is a concern for the players and you could argue that it is defamatory." Most representatives for the players named in the book did not want to comment. The Association of Tennis Professionals also did not comment or provide a representative from the Player Council. None of the players connected to doping in the book has tested positive for a banned substance. Nadal and Murray, in particular, have been outspoken about their sport's issues with performance- enhancing drugs. Nadal has said he wants all of his test results released to prove he is clean. He also sued a former French sports minister, Ms Roselyne Bachelot, for charging that his seven- month absence in 2012 was not because of a knee injury, but instead was a silent ban to hide a positive drug test. The case comes to court in Paris in July. Isner said he discussed only daily life on the tour with Brunt and never talked about performance- enhancing drugs. He said he would not have implicated any of those players. "There's not one shred of me that believes that those guys are doing anything illegally," he said. "They work the hardest of anyone and they deserve everything that they've achieved." Brunt said during his research, "people in a position to know" told him that the use of performance- enhancing drugs was "prevalent" in tennis. "I don't know the truth. I do not have the videotape," he said. "But there have been all sorts of rumours and speculations around certain players." The book is "real and pretty true to life or true to the speculation", he said, adding: "I'm not the one out here throwing darts. These darts have been thrown for years."